Today, I’m focusing on the first space we tackled, which is actually not in our home at all. We moved in March, so we wanted to be able to enjoy our backyard as soon as possible. We got started right away on removing the crazy overgrowth around our pool and patio. The below photo is from February, 2015. I insisted on visiting the house again before signing to ensure that we would have sunshine on our patio! Ha! Notice in the photos below that you can hardly see the water from our lanai because of all the plants. We had to hire help because the philodendron hope selloum plant (so freaking cool and I wish I could’ve kept it because you know how much I love fronds!) had such a huge root system that it required a little tractor to uproot it! Removing the plants from around the screened pool enclosure gave us a great view of the water behind our house. The privacy of the backyard is what really sold me on this property and enabled me to look past all of the updating that was needed around the yard and inside the house. After removing plants, bird house posts, bird baths and a large, beautiful tree that was unfortunately much too close for comfort and cast a lot of shade onto the house and pool, we had a patio installed outside of the screened enclosure using pavers. The laying of the pavers only took a day! It was fun to watch, but Summer and I mostly stayed indoors with the windows closed because of all of the dust that comes after cutting the pavers into the pretty curved shape that you see now. Miss Summer thinks she’s queen of the patio. Although we removed the majority of the plants and scraggly trees from our backyard, we did leave the huge fan palms on the right side of our pool enclosure to provide privacy. One last addition to our patio was the curved half wall that was installed a few months after our patio was completed. My husband liked the idea of a built in fire pit and wall, but I thought we would never really use it and it would take up some valuable space on the patio. Turns out, I was right! We bought a little gas fire pit for the holidays and used it ONE time. We are much better served by having the space for our hammock and chaise lounges. 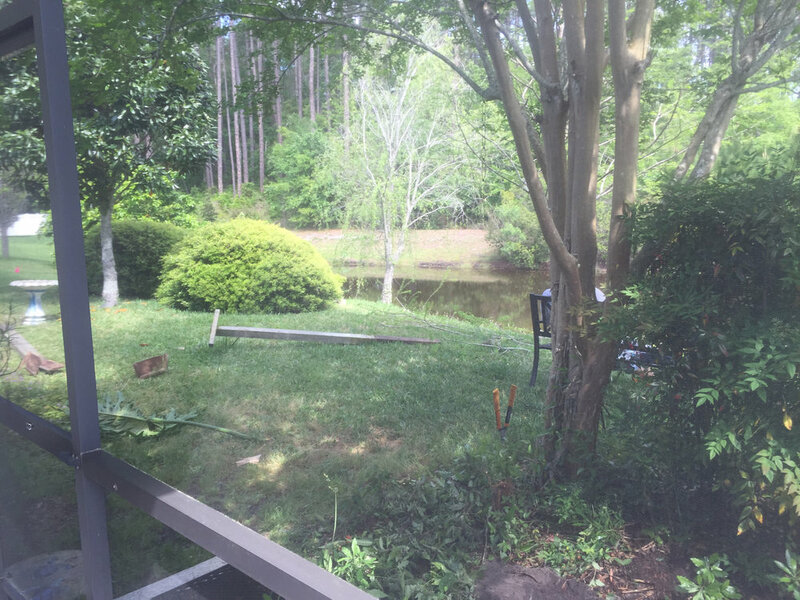 In the past couple of years, Florida has taken a few hits from hurricanes and we did end up losing both of our willow trees at the edge of the pond. Beyond having to pay for screen repairs and removal of the trees, we are fortunate that there was no other damage to our home. Here are a few more photos of our backyard throughout the seasons. Those yellow “balls” are actually grapefruit that I’ve tossed over the fence after picking them. They’re incredibly juicy. My dad made the bird house hanging from one of our magnolias by hand to match the one that my Gramma and Grampa used to have at their house up north. It’s sort of quaint and endearing, isn’t it? :) We now have our second family of birds nesting there. Miss Summer seems happy about it too. I’m so happy we made some of the hard decisions we did and that we’ve been able to relax and enjoy our backyard for the past 4 years! It’s not perfect, but we love it! Living in a county that is rapidly developing (i.e. forests are being torn down to pack in more homes everywhere around us), this little slice of paradise is definitely not taken for granted! Click the arrows for more Outdoor Living posts! How to Save Money on Outdoor Living!